The race amongst auto manufacturers to integrate Apple Inc.'s upcoming iPhone device within their automobiles is apparently on, with one report signaling out BMW as the current frontrunner. 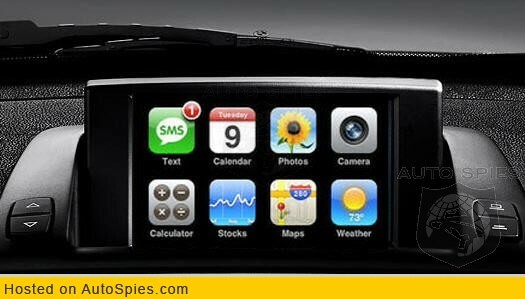 According to a blurb published by AutoSpies this week, the German auto maker will be the first to announce multi-level connectivity with the Apple device in an upcoming version of its high-end 7-Series sedan. The otherwise unenlightening report offers readers no additional detail aside from mentioning that the rumored integration will go beyond "just Bluetooth." Therefore it's unclear whether BMW would be ready to announce the feature alongside its updated 2008 7-Series models later this summer, or if it plans to wait until the following year. In 2009, the auto maker is expected to introduced a refined 7-Series model with a toned-down look and front end styling similar to the current 6-Series models. The new model will also reportedly add an option for an eight-speed automatic transmission. BMW was the first major auto maker to team with Apple on seamless integration between iPods and a car audio systems back in 2004, when it unveiled a car battery-powed iPod hookup that tucked the players safely in the glove compartment. The solution, which was revealed exclusively by AppleInsider, introduced a way for drivers to enjoy high fidelity sound through their car's stereo system while controlling their iPod using buttons on the BMW steering wheel. Looks like a photoshop work to me... Is this verified anywhere other than AutoSpies? The pic looks like the Navi from the Z4. Great! so you can use the Calendar but not the Phone? That's because it's a mock-up. No-one knows what it will look like; not us, nor AutoSpies.com. It would be nice if the iPhone could use the cars built in GPS receiver. Also the ability for kids to watch a movie in the back seat while driver uses GPS up front. Apple really needs to get into in-car entertainment/telemetry in a big way. That would be sweet. I personally go aftermarket if I dump that much money into a car, but my Dad on the other hand doesn't. So yeah. Where can you get quad-13" Boston Acoustic subs with two 18" roadthunders stock? Cool for the rest of the people who stay stock though! From what I heard, you can use current peripherals with the iPhone, so all integrated iPod systems should work...With that said, I guess you could technically state that BMW is still first, since they already did this in 2004, but then you could say they're the first to include integration of an iPod everytime a new model comes out. But that would just get annoying. I see BMW is continuing to hit new lows! "Hello Dave... I'm the HAL 9000 series for your new BWM. How are you today?" The above comment comes from somebody who used to modify and test them for BMW... before they started hitting the lows.